Going out to eat is one of my favorite things to do. I love it for all of the usual reasons like not having to cook, the food itself, socializing with friends, and just having a chance to get out of the house. But I also enjoy it for a not-quite-so-common reason: the inspiration it provides for my own cooking. This is something I hadn’t given much thought to in my previous life, but after several years of our current lifestyle I’ve come to realize that restaurant dining was my culinary muse and that eating one meal a week away from the house at a very limited selection of restaurants was starting to seriously stifle my creativity. Sadly, it took a period of rather stale meal ideas that left me going to back to the same old dishes again and again to come to this unfortunate realization. All was not lost, however. As with most challenging situations in life, simply changing the way you look at things can turn everything around. Rather than lamenting the lack of dining options (and therefore, the lack of inspiring dishes) I’ve begun to look more closely at what I do have available and to be inspired in entirely different ways. No longer do I set out to recreate an entire dish at home or to apply the flavor profile of a restaurant meal to a dish I already make. Instead, I focus on the the smaller details: one particular ingredient that stands out to me, the play of two different textures on the tongue, the vibrant color of a sauce. Once I made this shift in my thinking, the ideas started flowing again. Not only am I inspired once again, but my ideas and their edible results are better than ever (in my humble opinion, of course). This dish is sort of an embodiment of this inspirational transition. It has its beginnings a year or so ago, with my vegetarian take on a decidedly unhealthy (yet extremely delicious) acorn squash stuffed with sausage, cheese, and a bit of rice from the restaurant down the road. It was a decent enough riff, but nothing to write home about. Or even to make again. But the abundance of colorful squash in the markets lately made me want to give it another try, and fortunately this time I was also tossing around ways to use the wild mushrooms that I’d become just a bit obsessed with after a lunch of penne in a smoked gouda and wild mushroom sauce at another area restaurant a few weeks ago. Merging the two ideas proved to be just what was needed to bring my stuffed acorn squash from good enough to really great. 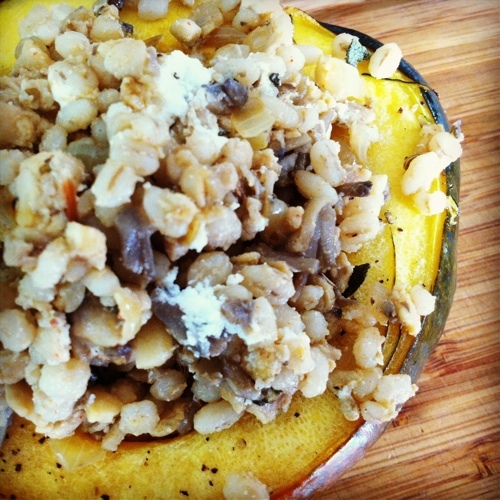 A hearty filling of tempeh “sausage”, barley, and earthy mushrooms fills a vibrant, tender, slightly sweet acorn squash shell. A filling but not overly heavy meal that makes use of some of the gorgeous and tasty produce available to us this time of year. Please enjoy it as is, or use it to inspire something of your own. This is a dish that is equally delicious with or without the cheese. I added it because I am of the opinion that everything is better with cheese, but if you’re vegan, lactose-intolerant, or just don’t eat cheese you really won’t be missing out on anything by omitting it. If you’re not a fan of goat cheese I expect feta, queso blanco, or a fresh farmer’s cheese would work well here, too. The mixture will be enough to fill 2 to 3 acorn squash, depending on how big they are. If you have any leftover filling, it’s pretty delicious on its own. Preheat the oven to 425 degrees. 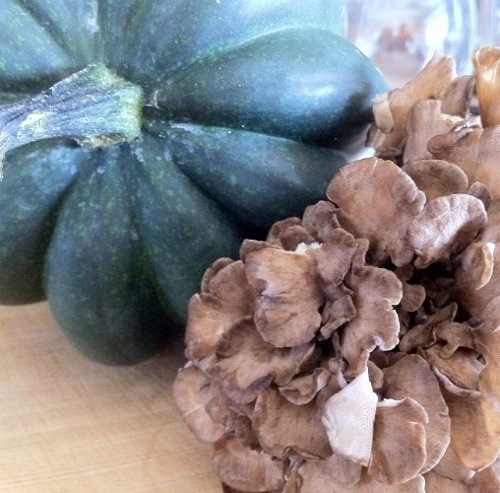 Cut each of the acorn squash in half vertically and scoop out the seeds. Place the squash halves on a baking sheet, drizzle with olive oil, and season with salt and pepper. Roast the squash for 20-25 minutes until the flesh is just fork tender. Remove from the oven and set aside. Meanwhile, fill a saucepan fitted with a steamer basket with an inch or so of water, 1 tsp of the fennel seeds, the peppercorns, and the halved clove of garlic. Bring to a boil, then put the crumbled tempeh in the steamer basket. Cover, turn down the heat, and simmer for 10 minutes. Remove from heat and set aside. While the tempeh is simmering, mix the sausage spice mix: combine the remaining fennel seeds, the ground pepper, marjoram, paprika, and salt in a small bowl. Set aside. Heat the olive oil, minced garlic, and onion in a saute pan over medium heat. Cook until the onions have softened. Add the crumbled tempeh and stir to coat the tempeh with oil. Sprinkle the spice mix over the tempeh and stir to combine. Add the chopped mushrooms, stir, cover, and cook for about 5 minutes, or until the mushrooms have softened. Uncover, turn up the heat, and cook for a few minutes longer, until the juices released from the mushrooms have evaporated. Transfer the tempeh mixture to a large bowl. Add the barley, chopped sage, and goat cheese, and stir to combine. Fill each squash half with a big mound of the filling mixture. Drizzle the stuffed squash halves with olive oil and return them to the 425 degree oven for another 20 minutes or so until the filling is hot and the squash is very tender.